When I was a little girl my parents had a cuckoo clock. In fact everybody in my family from grandparents on down owned a cuckoo clock. I was fascinated with the lovely things and the sound they made as they sprang to life announcing the time. It wasn't until I was about eight and a budding ornithologist that I understood cuckoos were honest to goodness real live birds. I was shocked! I thought someone was playing a joke on me! My father, one of the best amature ornithologists I have ever known, talked about how secretive these birds were. Once when dad and I were picking wild berries in the woods he gestured to listen and there is was...kuk-kuk-kuk. I'd heard a real cuckoo! It would be years before I actually saw one and even longer before I held one in my hand. 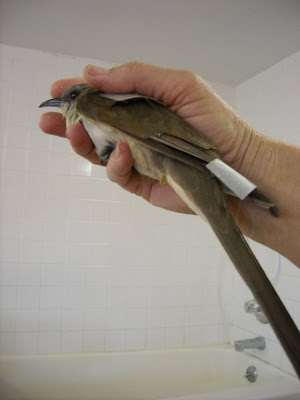 Our unfortunate Black-billed Cuckoo patient was likely hit by a car. He has a broken left wing and broken left leg as well as a head injury. He was fortunate that some very caring individuals pick him up and then brought him to REGI. I am not worried much about the broken wing and leg, we can fix those but the head injury will take more time. Not unlike human head trauma, these cases are more difficult. We are pulling for him. He has already made improvements in his condition so that is promising. My morning started off in an interesting way. Actually, I never have to worry about boredom with this work. Not only is everyday different than the one before, but every call and caller is as well. My friend and wildlife rehabilitation colleague Nicki Christianson of Wisconsin Rapids called and asked if I could meet a trucker that had a bird in her cab and was moving through Central WI. 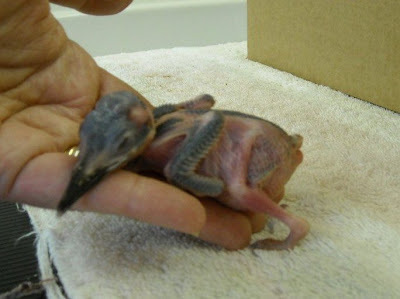 The trucker had been at a landfill and found someone had thrown away some baby birds one of which was still alive. They had no idea what the bird was but it had longish legs, no feathers and its eyes were closed. Humm! I said I would and then began the task of figuring out where the trucker would be at what time so she didn't have to loose time from her work and yet we would be able to intercept her to take the bird. We used all the lingo and calculated E.T.A.s for the meeting place. The plan went off without a hitch. The baby is very young and healthy despite his unfortunate beginning. When we got back to REGI I had my interns " key him out". That means to identify the species even when they all look pretty similar at this young age. My interns are pretty sharp because in a minute they looked at those distinctive feet and said " It is a Belted Kingfisher"! It sure is and believe it or not is already eating smooched up minnows. 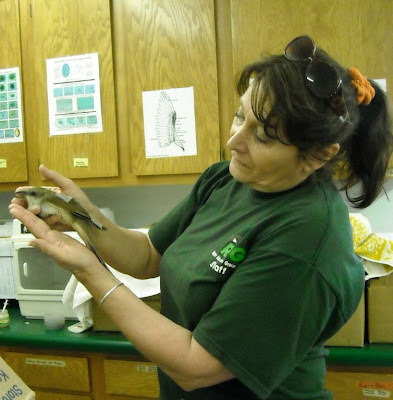 Many thanks to Denise and the wonderful people we meet everyday that care about wildlife and take steps to help wild ones in need. We don't always have positive experiences with the public. We sometimes find ourselves scratching out heads in disbelief with some of the things that people do. Some of course is just a case of not understanding, but then there are those cases where the situation is so blatant that it is infuriating. We admitted the baby American Robin in the photo above today. He is starving because the people that had him wanted to keep him. He was tame they said and they liked having him in the house. HUMM! When I asked how long they had the robin, silence was the only response until someone said " Maybe a week." I explained it is illegal for them to keep the bird and added we would be happy to care for it and get it back into the wild. They seemed disappointed at my willingness. HUMM! When I asked what they fed it during the week, there was silence once more. It seems the bird didn't "ask" for food so they DIDN'T feed it. SCREAM!!! The odd thing is they still didn't want to give up the bird. I sometimes wonder how people function in the world if our interaction with them is any measure. The little robin was tube fed and will be fed through the night. He is also in an incubator. We hope he will be with us in the morning. His first twenty-four hours will be the most critical. We do have good robin news. We have raised twenty ( 20) baby robins that are either already in the outdoor flight aviary or will be soon. 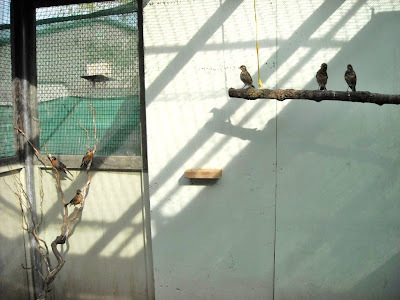 The flight aviary is their first step to independence and freedom. In the photo you can see several of the little ones and an adult male (left) that has been with us for years. He functions as a foster dad. He was grabbed by a cat defending his family a few years ago and suffered irreparable damage to his left wing. You can see in the photo he holds it lower than the other wing. We would be lost without him to guide our youngsters through this phase of their life. He loves it too and gets into the swing of feeding babies that still need some nurturing and teaching the others skills they will need in life. We are relieved not to have to do those constant feedings of the baby robins anymore now that they are older. However, just as some grow-up others come through the door to replace them. Did the poor starving robin make it? Inquiring minds want to know! One time people brought me a baby Killdeer that died on their way to my house. They said it made the perfect pet--it didn't need food at all! But they asked, utterly mystified, "Why did it die?" She is still with us although it has been a hard struggle to get her back. Her feathers will have stress bars from the extent of the starvation, so she will likely be with us until fall or even through winter. So sad. And...I had another similar situation tonight! Great to hear from you. Our heron is doing so well.